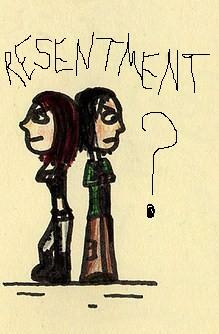 For a while now, I have been dwelling on the concept of resentment. To be sure, resentment has been a major topic of philosophical debate throughout the years. On the one side, some have suggested that resentment is valuable, while on the other side it has been demonized and set up as the antithesis of forgiveness. However, I am becoming more and more convinced that, like many of our emotions, feelings of resentment can be both good and healthy. Of course, to many this may sound completely odd. I mean, in Western culture, much of whose bedrock is built on Graeco-Roman philosophy and over-simplistic Judaeo-Christian readings of scripture, we grow up hearing "Do not harbor resentment (with the implication that it is either unhealthy physically or spiritually)" or "You have to let go of your resentment so you can move on". But are such statements really true? For example, is it really the case that holding on to resentment is unhealthy either in the spiritual or physical spheres? I would think not. Certainly, there can be unhealthy amounts and types of resentment but that does not make all resentment bad or out-of-bounds. We all know that some types of anger (righteous) and levels (controlled or prevented from violent action) are good and healthy. Just as well, we know that things like jealousy, doubt and fear, which are all often demonized right alongside resentment and anger, can also be good and healthy, especially emotionally and spiritually. Sometimes they even provide us with the motivation to finally act ,to do something! Among philosophers like Avery, Strawson, Walker and others, the misguided connecting of resentment to desire for revenge is also strongly challenged. Indeed, Margaret Walker's point that resentment seeks assurance from offenders that they can be trusted again is an incredibly healthy view, in my opinion. After Auschwitz, it seems to me that holding on to resentment until trust surfaces is not only the opposite of spiritual and/or moral maturity but in many ways, the very essence of it! As a Christian who believes in social advocacy and justice, having this view that I do allows me to make sense of many of the theodicy-like situations, whether big or small, major or mundane, that still take place on the world stage as well as in our personal relationships and local communities. For example, in seeing the value in a type of resentment that refuses to quit until trust can be established, social and relational ills such as manipulation, abuse, being taken advantage of, etc. can all be avoided. I think that when we talk about forgiveness, this MUST be borne in mind. How many pastors or laypersons have convinced the beaten wife to stay in the house or marriage? How many church folk have overlooked the mistreatment of children? How many ministers have been at a loss for words when they were confronted with manipulation in relationships among their congregants? That loss for words, that not knowing what to say is not merely awkward, it is sad! We should be able to say without hesitance in such situations, "Let's get you out of that situation right now, if and when trust surfaces again--and it may not!--we'll start working on forgiving and perhaps reconciling, for now, however, let's go!" The point is: Forgiveness is not a trump card OVER resentment. Resentment is NOT evil. Resentment does NOT hold us back. Resentment is something of an innate emotion that helps protect us, that keeps us safe, that demands justice, that demands respect and that challenges abusers and manipulators. Thus, when we say the Lord's Prayer from week-to-week and get to the line about "forgiving our debtors / transgressors" let us not forget how intimately that phrase is connected to the next one "as You (God) forgive our debts / transgressions". God doesn't like cheap grace and really, wants nothing to do with it. God's forgiveness isn't cheap. And maybe, just maybe, God really doesn't forgive until he knows that trust is available. Yes, we want instant forgiveness just like we want instant everything else. But can we really sin all week long with the knowledge that on a sunday morning we can also cheapen grace? I think not! Maybe God holds a healthy amount of resentment towards humans, again, waiting until trust surfaces. I know that many will hate this view and that it will, as I said, make many uncomfortable. Without a doubt, we want an easy, my-way-right-away kind of Christianity, a type of faith that offers immediate, on-the-spot whatever I want from God. Yet, that is nothing more than manipulation and well, I'm at the point where I think I can say confidently, "God resents that"! And because that is the case, maybe the feelings of resentment we have are not so off-base or out-of-bounds but rather, right on-target. If so, then we might just call this resentment a healthy gift from God!